It's been a long time since a new Guerlain fragrance tempted me. Even Guerlain old timers have fallen out of favor. I've found vetiver perfumes I prefer to Guerlain Vétiver. Mitsouko is now used in my house more as a home fragrance than a perfume to put on my person. Jicky don't smell like Jicky no more (sounds like the title of a 1920s song, doesn't it?) The only Guerlain survivors pour moi are Habit Rouge and Les Eaux — Eau de Cologne Impériale, Eau de Cologne du Coq, Eau de Fleurs de Cédrat and Eau de Guerlain. I came across (and bought) a small bottle of Guerlain's 1911 Pour Troubler1 Extrait years ago when I was searching for vintage Houbigant Fougère Royale Eau de Toilette on eBay. On that day, I could only find a bottle of vintage Fougère Royale aftershave and it was worth every penny...and is long gone (never hoard your favorite perfumes or they'll be thrown in the trash when you croak). Yeah, that $200 was REALLY well spent! My Pour Troubler has aged very well (or so it seems to my nose). Its herbs have created a rich bouquet garni opening, with sweet lavender, cloves and silky rosemary. Quickly a floral bouquet arrives, with jasmine and rose tightly entwined. As Pour Troubler dries down I smell moss and a warm aroma that smells very much like immortelle. The pleasant immortelle mixes well with the hints of rich musk that round out the perfume. Pour Troubler's extreme dry down presents talcy civet mixing with the immortelle aroma, creating a lively and not-too-sweet amber accord. Pour Troubler smells expensive and "classic." Pour Troubler, to me, is especially well suited for men and wintertime wear; I think of it as the great-grandfather of Etat Libre d'Orange's The Afternoon of a Fawn. 2. 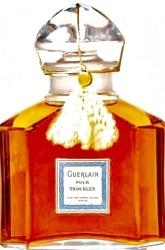 See Monsieur Guerlain for more information on Pour Troubler. Sounds delicious! I am now needing a generous dose of Yatagan after reading your review of Pour Troubler. Not quite sure why that Yatagan immediately came to mind, but I will be wearing it with careless abandon tomorrow, haha. Lindeberg, they’d make a good couple! Noz, I even have the proper curtains come winter! Oh no, that sounds like a dream perfume! You *are* evil, Kevin! Interesting that it has survived that well, since Chypres usually don’t (compared to more bottom-heavy blends like orientals). I still managed to sample Afternoon of a Faun. A pity since I have a real fascination for Nijinsky, the God of dance. Perticulatly how we has been described as a marvel on the stage, but a social disaster privatly. Jean Cocteau, infatuated with his on stage presence, was shocked when visiting him back stage (Short fingers! Looks like a shop assistant!). Des ess…yes, I lucked out…hope you can try The Afternoon of a Fawn, it’s one of my favorites. Kevin, I’m curious to know your thoughts on Derby. I remember being blown away by the original formulation when I first smelled it in the early 90s. When I smelled the re-release in the rectangular bottle in Paris a couple years ago, I didn’t like it. Probably reformulated and my sniffer is older. Michael, I agree; Derby has surely been reformulated.